To view Gerber and Excellon files generated by Dxf2gbr©, the Laserlab, Inc. AutoCAD .dxf to Gerber translator, we recommend using ViewMate by PentaLogix. ViewMate is a free Gerber viewer program that allows you to view and measure virtually any Gerber file or Excellon drill file. The program is supplied as a self-installing executable file and runs on computers with Windows XP, Windows Vista, or Windows 7. Fill in the registration form. Make sure to enter a valid email address. Submit the form. You should receive an email with the download password. Use the password that you received via email to login. Laserlab, Inc. keeps a copy of ViewMate available for download as a convenience for customers, but it may not be the most recent version. For the latest version of ViewMate, use Option 1 (above). 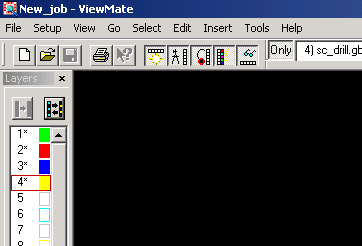 Laserlab's copy of ViewMate is named viewmate10_01.exe and is 10,184,258 bytes long. Download here. Download to a convenient directory on your hard drive. Run the program. This starts the installation process. If you wish to remove ViewMate from your computer, use the Add/Remove Programs tool found in the control panel. Go to File->Import->Gerber or File->Import->Drill&Route. 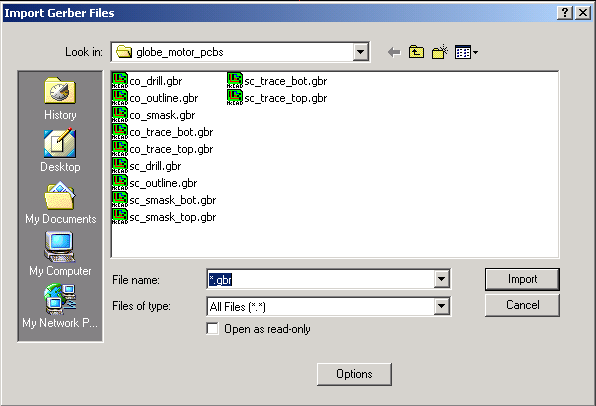 Note: Laserlab supplied Gerber files have a .gbr suffix and drill files have a .drl suffix. Navigate to the directory containing the Gerber or Excellon files and select them. Tip: You may select multiple files for loading by typing *.gbr in file name box, then use shift-select or control-select to pick them. Click the Import button when finished selecting files. When importing Excellon drill files (.drl suffix) make sure the drill file options are set correctly. Press the options button at the bottom of the File->Import->Drill&Route dialog box. The following dialog box will appear. Make sure the settings match the picture below. 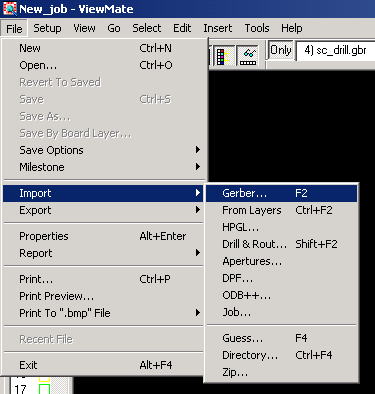 Turn on and off layers by double-clicking the colored rectangles in the vertical strip along the lefthand side of the screen. If you leave your cursor on a rectangle for a few seconds the file name will appear in a small pop-up. Zoom around in the files by clicking the magnifying glass icon on the Zoom: toolbar, then left click-hold-drag to create a zoom rectangle. To zoom back to the full view, press the Icon next to the magnifying glass that looks like a magnifier behind a red grid. To flip on and off aperture fill / centerline mode, press the icon that looks like a red circle with a vertical line extending from the center downwards. This is a toggle that flips between vector fill and centerline mode. If the image looks broken up with gaps, try this button. 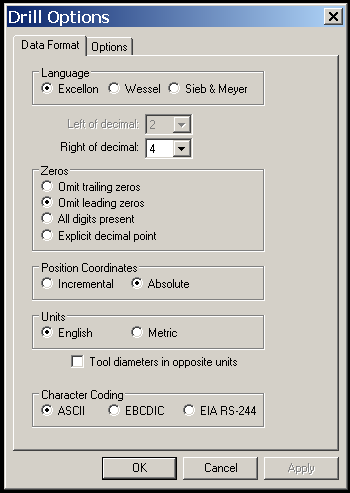 Click here to read about Dxf2gbr©, the Laserlab AutoCAD to Gerber translator.